With his sights set firmly on defending his World Championship titles in Beijing in four weeks, Usain Bolt signals his return to top flight completion with a 9.87 seconds in the 100m at the Sainsbury Games (London Diamond League ) today. Bolt had an easy and resounding victory hanging on the shoulder of American Mike Rodgers, before shutting it down to cross the line in 9.87 in a headwind of 0.8mps. Rodgers was second in 9.90 seconds with the Jamaica’s Kemar Bailey-Cole finishing third in 9.92 seconds. The conditions were less than ideal for sprinting as the track was wet from earlier rain and the temperature readings as reported in the 60’s. This was Bolt’s first competitive race since he last competed in the 200m at the Adidas Grand Prix (New York Diamond League) back on June 13. Bolt won his event in a pedestrian time of 20.29 seconds. 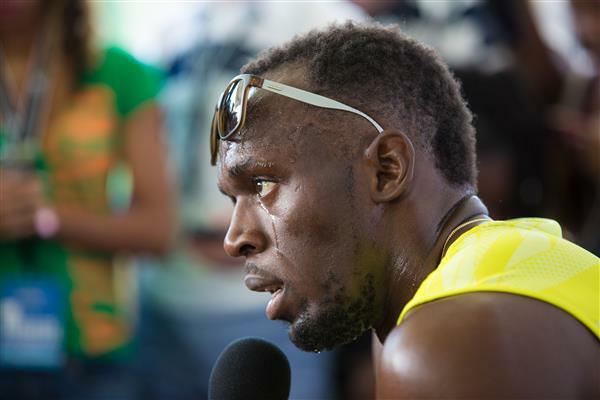 It was later reported that Bolt had sustained an injury that kept him out of the Jamaican Trial at the end of June. It was also reported that Bolt sought treatment from Germany’s renowned medical specialist, Dr. Hans-Wilhelm Muller-Wohlfahrt. Treatment went well and Bolt returned to training. Based on his 9.87 performance today, it can be concluded that Bolt is back and should be in a strong position to defend his world titles in the 100 and 200m. In Bolt’s absence, American sprinter Justin Gatlin has been setting the track and field circuits on fire with his impressive performances. This season, Gatlin has set personal bests in both the 100m (9.74) and the 200m (19.57) and has posed a viable threat to Bolt’s 100m (9.58) world record. Bolt’s performance today indicates that he is in great shape and a healthy Bolt could derail Gatlin’s quest to win the Beijing sprint titles. A fit Bolt and an undefeated Gatlin could be the best storyline for the upcoming world championship. Stay tuned.